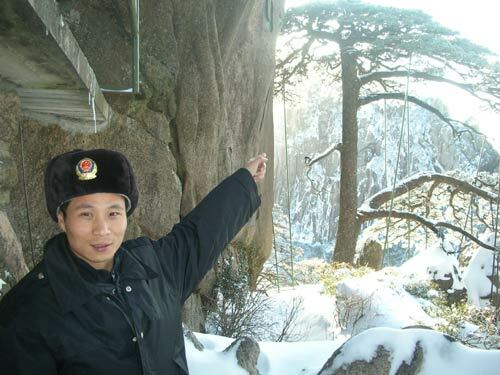 HUANGSHAN, Anhui - As the onset of falling snow blankets Huangshan Mountain, one thing is weighing on Xu Dongming's mind - keeping the weight of the snow from harming the mountain's most famous tree. "The Guest-greeting Pine to Huangshan Mountain is like the Great Wall to China," said Xu, one of a team who keeps an eye on the 1,000-year-old tree 24 hours a day. "Many of us (colleagues) and tourists owe a great respect to the tree." The oft-painted and photographed tree stands at the end of a mountain path, its roots dug into crevices in the rock, branches hanging over the embankment. As a "bodyguard" of probably the most famous tree in China, Xu has to ensure the pine won't topple or collapse in winter gusts or under the heavy snow, one of the biggest challenges the tree faces every year. In fact, he spent two sleepless nights when the first snow of this year wrapped the mountain in a white shroud. The 30-year-old, joined by 20 of his colleagues, started putting up 16 props to support the pine's major branches on Tuesday afternoon, and managed to finish before midnight as the snow began falling. "The wind was blowing too hard," Xu said, which made it difficult to set up the props. "But we're glad we finished in time because that's about the best way to fight the snow." The props, made of elastic plastic and rubber, help shoulder the weight of snow on the branches without hurting the tree, Xu explained. "They are much better than pure wood, iron rods or bamboo, which we used before." Since getting the props in place, Xu and three other colleagues have been taking shifts 24 hours a day to check on the tree every 20 minutes. "We have to ensure that the props are in the right positions and the tree stands OK in the strong wind and heavy snow," said Xu, wrapped down to his ankles in a cotton-padded overcoat to battle the -9 C weather on Wednesday. Along with grotesquely shaped rocks, seas of clouds and hot springs, pines are regarded as one of the four wonders of Huangshan Mountain, which became a UNESCO world heritage site in 1990 thanks to its unrivalled picturesque beauty. Since the uneven terrain prevents the pines from growing upright, they grow into various crooked shapes, or even downward. Due to the poor soil and climate, the pines grow very slowly - a tree less than three meters high may have grown for several hundred years. "Having withstood the cold wind and penetrating rain for centuries, these pines with such a distinctive shape symbolize both fraternity and tenacity," Xu said. The Guest-greeting Pine, whose name comes from its branches that extend like a person's greeting arms, is of more iconic significance because of its age and fame. However, due to its age - estimated to be more than 1,000 years old - the tree is becoming increasingly vulnerable to extreme weather. "In a sense, I'm like a full-time nanny for the pine tree, which in my eyes resembles an old man," Xu said, rubbing his hands for warmth in his office - and his resting place - a 6-square-meter cottage 12 meters from the Guest-greeting Pine. A heater only manages to keep the temperature at around 10 C.
On a normal day, Xu spends about 18 hours in the cottage, usually from 5 am when tourists start arriving to 11 pm when night settles in the mountain. He checks on the pine tree every 30 minutes to ensure everything is all right with its trunk, branches, leaves and blossoms. Pinewood nematode, which brings wilt disease to pine forests, is the No 1 pest Xu has to be wary of. But extreme weather, especially frost and snow, has been the most serious challenge in the past few years. Xu remembered the unprecedented snow in early 2008, which stranded millions on the way home before the Spring Festival, paralyzed numerous electricity networks and weighed down countless houses and trees. The Guest-greeting Pine, along with 53 other trees more than 1,000 years old on Huangshan Mountain, stayed almost intact. "That was the most difficult winter I've had since I took this job," Xu said. Dozens of Xu's colleagues joined Xu on the mountain for the fight against the seemingly endless bluster that piled up snow to the height of a person. Xu stayed with the tree for more than two months, during which time his wife gave birth to their only daughter. After more than five years on the job, Xu said he can tell within two minutes if anything is abnormal with the tree from the color of its leaves or bark. "Somehow I've become half a horticulturalist over the past few years," Xu said, half jokingly.